Pets Costs > How Much Does a Pufferfish Cost? How Much Does a Pufferfish Cost? A pufferfish, also known as blowfish, is believed to be the second most poisonous vertebrates in the world next to the golden poison frog. The pufferfish developed the ability to inflate many times its size using water and air in order to avert predators since they are typically slow moving fish. When the pufferfish inflates, there are many spines surrounding it, making it inedible for other fish. The pufferfish contains tetrodotoxin, which is known to be 1,200 times more fatal than cyanide. In fact, a single pufferfish contains enough poison to kill 30 human beings, and unfortunately, there has been no known antidote for it yet. Despite this fact, however, many people still seem to be fascinated with this species. In Japan, the meat, known as fugu, is an expensive delicacy. Other people also find the fish lovable enough to be a pet. Since there are so many different species, the costs of a pufferfish will range anywhere from as little as $2 to as much as $65. Most species, however, will be less than $35. The larger the species is, the more it is going to cost; in general, anything over four inches is usually considered to be large. Common species include the dog face puffer, fahaka, porcupine, saddle, spiny box, spotted and leopard. LifeAquaria.com, for example, has a large selection of pufferfish that range from as little as $25 to as much as $65. The narrow-lined puffer retails for $24.99 while the leopard puffer retails for $37. On eBay.com, at the time of this writing, there were a handful of “buy it now” listings ranging from $40 for a four-inch porcupine puffer to as much as $85 for a tropical fahaka puffer. NOTE: These price estimates are for fish smaller in size. 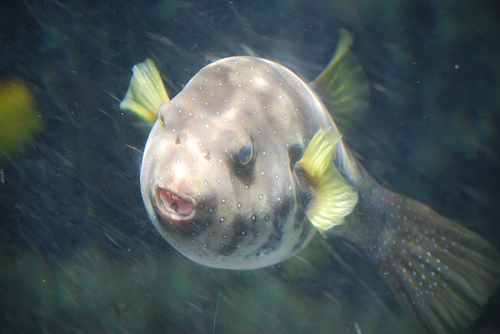 A 50 to a 100-gallon aquarium is recommended for a pufferfish. Most aquariums will start at $50 and go up from there, depending on the type of aquarium and set up you wish to purchase. Saltwater tanks are a must for pufferfish and are much more expensive than freshwater tanks. On Amazon.com, for instance, popular 100-gallon aquariums easily cost more than $450. Aside from the aquarium, accessories, such as the aquarium lighting system, sand substrate, plants, a heater, filter, water conditioner, probe thermometer, hydrometer, and pH test kit, will all be needed for your tank. All of these accessories, when purchased brand new, can reach well into the hundreds. Salt water will need to be replaced partially every month at a minimum. Two buckets can cost less than $200 for the year. A useful bacteria solution, ammonia, nitrate and nitrite water testing kit is recommended to ensure that the water is healthy enough for the fish. Like any other animal, fish food, such as earthworms, bloodworms, squid, crab, and/or mussels in the shells, will need to be budgeted for. It’s important to vary its diet to ensure a proper nutritional balance and feed up to two times per day. The average adult size, depending on the species, can range from three to 25 inches, according to Petco.com. Depending on the species, some pufferfish may thrive in freshwater, in brackish water or in a combination of both. Keep a close eye on the temperature and pH level of your aquarium, ensuring that your puffer has enough places to hide and sand to search through. Pufferfish have the ability to gulp down a large amount of water, bloating themselves up to appear large and round. This characteristic seems to warn humans and predators not to get nearer or catch them because of the poison it brings. Pufferfish are known to be clumsy swimmers. A spotted puffer fish is not a beginner’s pet. This quirky fish tends to eat other fish, nip at their fins or starve itself because it is not quick enough to compete with other fish for food. Even though eating pufferfish can be deadly, it is still a popular food in some countries; however, some breeders in Japan have recently bred a red puffer fish that is poison-free. Pufferfish are not considered to be a community fish. They have the tendency to eat other species and are, therefore, better kept in a separate aquarium. Signs of a poor fish may include cloudy looking eyes, weight loss, erratic swimming or spots near the mouth. Look for used saltwater tank set ups. You will most likely be able to find one online at sites such as Craigslist or eBay.